Children getting off school buses Thursday at Superior Creek Lodge saw their lives packed into trash bags and suitcases and thrown into pickup truck beds and car trunks. All four buildings of the extended-stay motel in East Ridge are now condemned, and almost 1,500 people and 300 families are displaced from their homes, according to the Salvation Army. Buildings B and D were condemned Thursday; and buildings A and C were condemned Wednesday night by East Ridge city officials. One man said his daughter, who lived in building B, was told to have all of her belongings out of her room by 11:30 a.m.today. Management from Superior Creek Lodge then kicked a Times Free Press reporter off the property. Residents continue to move out of one of two condemned buildings Thursday at the Superior Creek Lodge in East Ridge. 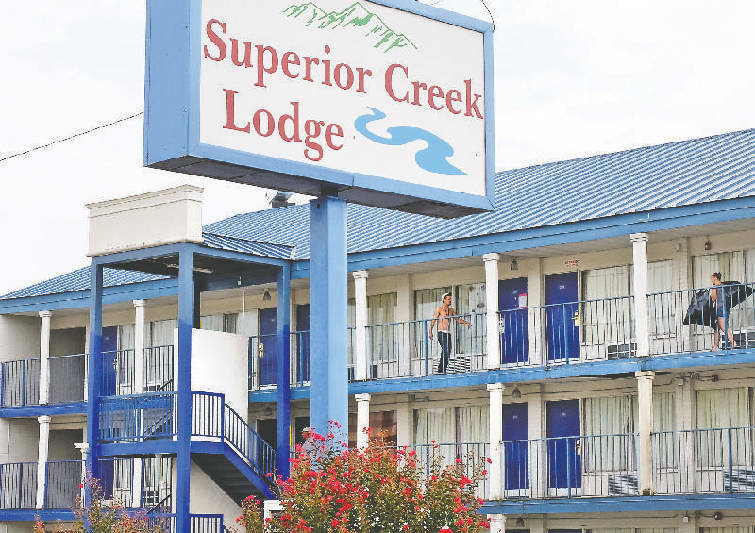 The situation unfolded after East Ridge city officials received a complaint against Superior Creek Lodge on Tuesday. During an inspection, city officials asked a maintenance worker to remove a portion of the ceiling soffit, which revealed the decaying wood of the balcony walkways, the main entrance for residents. In a report obtained by the Times Free Press, officials are seen tearing wet, decaying wood off the structure with their bare hands, and staircases crumbling. "We believe these issues require Building A and Building C to be immediately vacated and condemned due to the imminent danger of failure or collapse of these buildings," a letter from the city to Superior Creek Lodge reads, "which poses an immediate danger to human life or safety." No such report was available for buildings B and D as of Thursday evening. Mike Williams, East Ridge fire chief and interim city manager, said there were "life-safety issues" with the structures, but would not elaborate about specific damage to buildings B and D.
This isn't the first time Superior Creek Lodge has gotten the attention of the city for the wrong reasons. In 2010, East Ridge officials filed a petition to close the complex, saying it had become "a public nuisance" after an extensive list of crimes had been committed by residents of the motel. When the decision to condemn the buildings was made Wednesday, the city called the Salvation Army. The organization was at Superior Creek Lodge on Wednesday night and Thursday afternoon helping people figure out what to do next and praying with them, said Kimberly George of the Salvation Army. George said the Salvation Army was at Superior Creek Lodge a few years ago when a massive flood damaged several units. Typically, George said, the Salvation Army responds to situations of mass displacement, such as natural disasters. "This situation is unique because it's just structural with the building," she said. Thursday afternoon, 11 Chattanooga-based social service agencies along with representatives from the Chattanooga and Hamilton County governments met to discuss how to help the now-homeless 1,500 people. The Salvation Army offered residents phone numbers and addresses of local hotels and apartments. For those unable to afford a hotel, Metropolitan Ministries secured a grant from the Community Foundation that paid for 41 families to be housed through Monday at four local motels. On Monday night, the families will come to a Joint Information Center meeting to discuss further assistance, George said. A total of $15,612.14 was issued Thursday night for displaced families, which includes ten staff member's families — who not only lost their homes but also their jobs — have been given enough money to stay a week at local motels. Additionally, East Ridge United Methodist is housing 31 people and Spring Creek Baptist is housing four families for the time being. Heather Chaffin, who said she used to be the assistant general manager at Superior Creek Lodge and lived there for two years, said she knew this day would come, because the balconies sagged badly when she lived there. Chaffin said she moved out of the complex Dec. 26, 2014, and came back Thursday to help a friend who doesn't have a car move out of his apartment. She was kicked off the grounds of the complex by employees who were allowing only Superior Creek Lodge residents to enter the property. "It needs to be torn down," she said.